JAKARTA, Indonesia — Investigators of the Oct. 29 crash of a Lion Air flight into the Java Sea say the Boeing 737 MAX aircraft was deemed airworthy when it made its final takeoff from Jakarta. 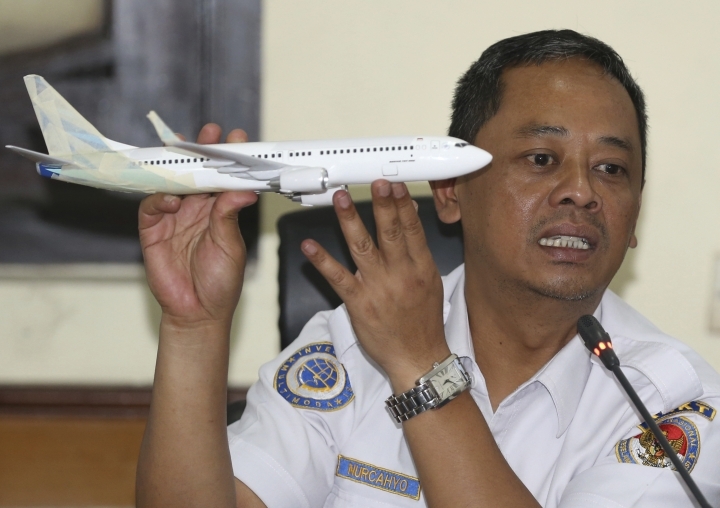 "The NTSC and the Head of Aviation Communication never stated that Lion Air, Boeing 737-8 MAX aircraft registered PK-LQP, was not airworthy," said investigator Nurcahyo Utomo. The issue of airworthiness is crucial because of concerns over technical issues with the new Boeing 737 MAX that crashed and questions over the airline's safety procedures. "This condition is considered as an un-airworthy condition and the flight shall not be continued," it said of that flight. Utomo said that based on maintenance records, flight engineers had made repairs and run tests as needed. "Based on the test results, the aircraft was declared airworthy, also when the plane departed from Jakarta, the aircraft was in airworthy condition," he said. Another investigator, Ony Suryo Wibowo, said there were special procedures to be followed when there are problems with an aircraft. "But in principle, when the engineer has stated it's airworthy, then it's airworthy," he said. Wibowo said the pilot would make the final choice about whether or not to cancel or abort a flight, and the investigators were trying to understand how the pilot made his decision. "When the plane is on the ground, the responsibility for airworthiness is on the engineer, and when the plane is in the air, the airworthiness is entirely in the pilot's hands," he said. Experts say Boeing may need to change its new anti-stall system, perhaps developing an algorithm to disregard sensor readings that appear off-base. The aircraft maker has a great deal at stake in defending its plane. More than 200 MAX jets have been delivered to airlines around the world. Pilots at American Airlines and Southwest Airlines complained this month that they had not been given all information about the new automated anti-stall safety system on the MAX.